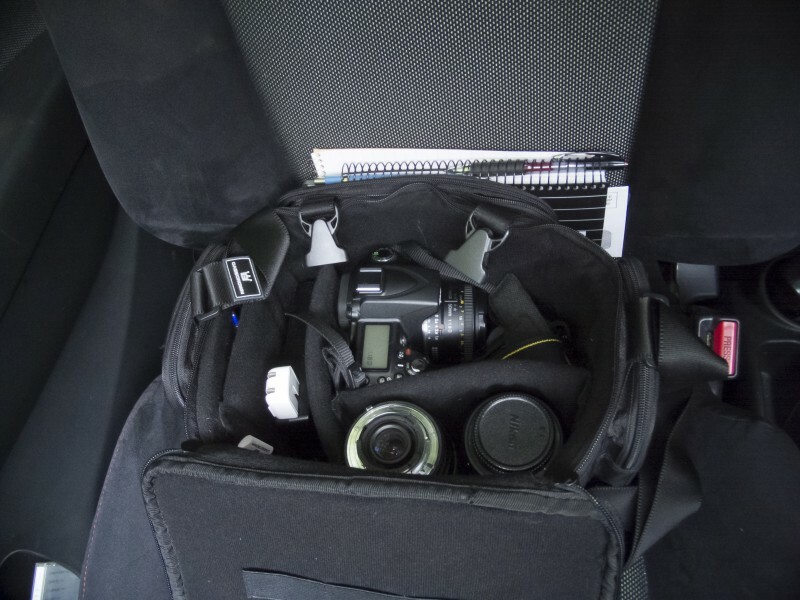 This is my camera, nestled in its bag, resting on the front seat of my car. That’s where it sat one week ago today when I was at the lake that I like to visit. The morning was misty, almost drizzling, and I was standing on the dock, just like I always do, when I saw the eagle. I’ve seen it there before. Taken dozens of photos of it. Last year I got a shot of it chasing off a large hawk, the two of them colliding mid-flight above the water, but below the tops of the trees. Of all those shots, none of them is a keeper. Low light leads to either motion blur or too much grain. Not enough zoom keeps the subject too far away to be of interest. Last week I didn’t care about any of those things. I stood there in the mist, not wanting to be anywhere else in the world, watching this great bird soar the length of the lake, scanning for prey. I had another camera with me, but the point and shoot stayed in my pocket and I just stood and watched as he disappeared from sight to the right. I continued to watch as he reappeared, passed the spot where I stood, and began to descend toward the water. Briefly I thought that I should have a camera in my hand for what might come next, but I didn’t want to change anything. So I didn’t move, and the eagle dropped faster. Wings folded, talons forward, he hit the water hard, then moved upward so quickly it was as though he had bounced off of it. While he was still low the fish he’d grabbed was clearly visible against the surface of the lake which was white from the reflection of the sky above. As he rose the details became obscured against the trees, and I wondered if I’d really seen what I thought I had. But when cleared the tree tops, and was silhouetted against the pale, gray sky, the fish was clearly there in his grip. A very tiny part of me wishes I’d gotten a shot of that, even with grain or blur. But the timing of that event was so perfect, and so unlikely, that I’m far more grateful to have been there, under those exact circumstances, than I am regretful over missing the shot.